It has been said that in today's organisations survival is optional. One of the keys to survival is having the right people trained to peak performance at the right time. 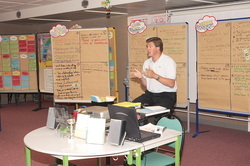 Tomorrow's Master Trainers will also be performance consultants, facilitators and internal change agents. They will have to be designers of ‘instant’ learning experiences. They will have to deliver and perform with enthusiasm and professionalism in training courses and sometimes facilitate change sessions with sensitivity. Practiced facilitating a "learning discussion"
Experienced the "training room of the future" environment by using the talking wall approach to designing exercises. Instructors and group facilitators who want to transform "dull" courses into lively learning experiences. Public programmes take place at our premises in the heart of Geneva, or you can contact us if you would like to organize a Transforming the Trainer workshop (or any other event) exclusively for your company.